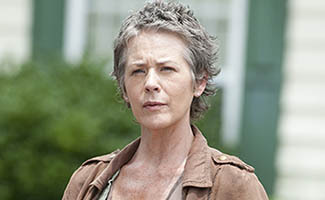 EW published a new interview with Melissa McBride, the woman who plays the conflicted Carol on The Walking Dead. The majority of their conversation was about the cliffhanger, which Carol wasn’t included in. This hasn’t stopped folks from pumping her for information. Like every other cast member, everybody McBride meets at the store or waiting in line at the bank asks her the same question: “who died?” The dumber ones add to this, “Was it you?” This list includes McBride’s own mother. Sounds like a mother all right. As for the people she’s met who are angry — and she’s met plenty — McBride promised the wait would be worth it. Given that her scenes take place apart from Negan’s compound, she might have not seen everything, but she’s liked what she has seen. Very much so. I hope those people that feel jilted will tune in because the premiere is just going to be… oh God, it’s going to rock the walls. The wait is worth it. Whether you’re angry with it or whether you liked the cliffhanger or whether you’re pissed off about it, the wait is worth it. The Walking Dead rocks the walls October 23 at 9 PM.